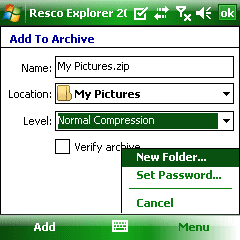 For those who may not be familiar with Resco Explorer, it is a collection of software tools that will give you all the power you need to manage your files, pictures, folders, etc. on your WM phone. It has historically been, by far, one of the most comprehensive utility collections for the WM OS for the past several years. 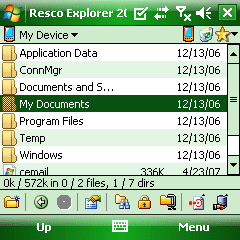 In fact, Resco Explorer has made number one on my must have software list for the last 4 years running... and it looks like it will continue this trend with my upcoming Must Have Software for 2008 list. 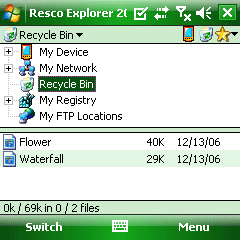 So when Resco released Explorer 2008 in mid June, I was very excited to get my hands on it and see what innovative advancements Resco added in this time. Resco gave me a copy of it to review and I have torn it apart. 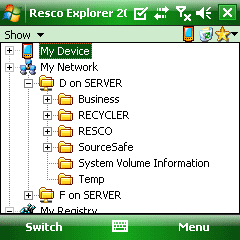 Before I even get to the tools included in Resco Explorer 2008, I want to look at the new navigation that they have implemented. 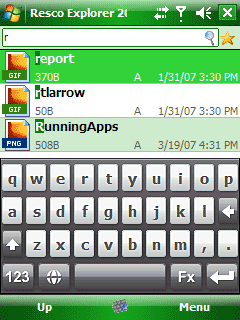 When you start Explorer 2008 for the first time, you can choose what mode of navigation you prefer. There is a standard mode (list only), Compact mode (list + tree), Custom Mode, and the new Touch optimized mode. Resco has added finger sliding friendly navigation. You can now explore any picture, MP3, folder, or file on your WM phone with a slide and tap of your finger. It is nicely responsive and easy to use. If you are an old time WM user who is resistant to the new wave of easy WM navigation... no worries... you can use it with your stylus mandatory traditional mode as well. I have hundreds upon hundreds of MP3's on my SD card. Sliding your finger to scroll down the list is nice, but can get very tiresome if you have a large list of files to scroll through to find the one you are looking for. For this, Resco has added Letter Bar Navigation. When you start to slide, the alphabet pops up on the left side of the screen. You can then just tap the first letter of the file you are looking for and you will jump there. 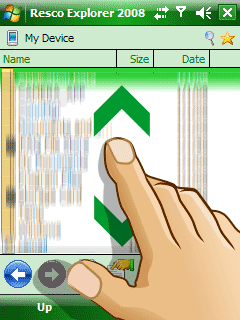 Then just scroll a little bit to find the file you want. Another ingenius addition is their Virtual Folders. 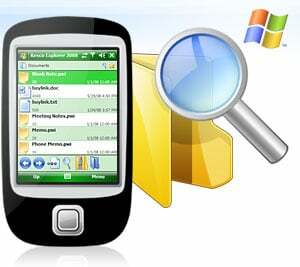 They have virtual folders that will automatically populate with the type of file that folder is geared for so all file types associated with what you are looking for can be found in these folders, without the need to look for them in all your folders on the device or on your storage card. 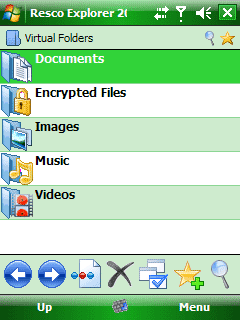 These folders include Documents, Encrypted Files, Images, Music, and Videos. This is very handy, especially when you don't know exactly where the file is stored on your WM phone. Resco has spared no expense when adding tools to Explorer 2008. What is also amazing is the range of users that all these tools target. 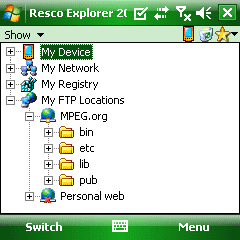 A beginner with their first WM phone will appreciate how easy Resco Explorer 2008 makes it to find files or the built in picture viewer, while the advanced IT professional will also love their advanced tools like the FTP Manager, strong file encryption, or the Network Browser so he can surf his network at his corp offices from his WM phone. This is the heart of the package. The File Manager is everything that that the WM File Explorer should be, but never will be. Managing (copy, deleting, moving, etc.) your files and folders is just the beginning. If you tap and hold on a file or folder, a popup menu gives you just about every option of what you could possibly want to do with that file or folder... everything from viewing its properties to sending that file or folder to another WM phone via a Bluetooth connection. To see the File Manager in action watch this 2 minute tutorial video by Resco. Have you ever deleted something and realized as soon as you did you it, that it was the wrong file? Then you will appreciate having a Recycle Bin on your WM phone. You can adjust the amount of space of storage it takes, but 10% of your available space is a small price for such a valuable level of peace of mind. Are you concerned about any personal or work related files or folders falling into the wrong hands if you phone is ever lost? I am... and if you are not, you should think about it. With the Strong File Encryption, you can use the Enhanced Cryptographic Provider with strong algorithms such as RC2-128, DES-56, 3DES TWO KEY-112, 3DES-168. Additionally, you can also install a Windows 95/98/ME/2000/XP/Vista shell extension to use the encryption/decryption process on desktop PCs. Storage can become tight on a WM phone. Also working with and managing compressed files that are emailed to you can be challenging on a WM phone. For this you can use the Zip Compression tool. You create and uncompress both Zip and RAR files. The used ZIP algorithm is PC compatible, so you can extract archives created on a desktop PC and vice-versa. 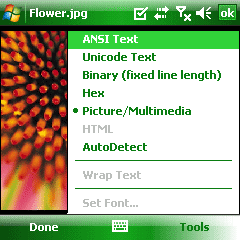 While browsing your files in the File Manager, you can use the Built-In Viewer to view any TXT, BIN or HEX format, as well as JPEG, GIF, BMP and PNG graphic formats. You can even do basic editing on the graphics, like rotate the picture so it is not upside down anymore. It even offers zoom and slideshow features. This is VERY handy, and it is so will integrated into the other tools I end up using it more than I realize, until I stop to think about it. This tools is certainly for the more advanced users. With it you can browse any shared folders on your home or corp network. You can map network hard drives to your handheld and use them as if they were a hard drive right there on your your WM phone. It is very slick. This is again another tool for the more advanced user. With the FTP Manager you can access any of your personal or corp FTP accounts. So directly from your phone you can upload that Excel Spreadsheet to your your corp server, or upload that picture you just took while screaming on a ride at Disneyland, to your personal website for the rest of your family to enjoy even before you get off the ride. Besides the File Manager, the Registry Editor is by far my next most favorite tool. It has been my exclusive WM registry editor for several years now. 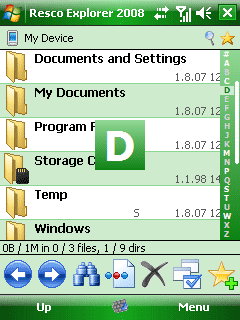 It has received all of the navigation tools that the File Manager has. So you can now browse your registry with a slide of your finger. With how much easier it is to navigate, there is absolutely no doubt that this is the best registry editor on the market, bar none. If you are not sure what the WM Registry is, or if you think you might be too scared to take a crack at editing it, then you must take a look at WMexperts' in depth step by step tutorial on editing the WM registry that will walk even the newbie through this fun and engaging process. 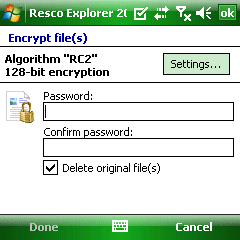 In addition to the amazing navigation options and the comprehensive collection of tools, Resco Explorer 2008 also offers some additional features and just about any option you can think that you might possibly want or need... and then some. They have included their own finger friendly keyboard for easy searching for file names. As with most WM utilities they have also included a Today Page plugin. I personally like their plug in and use it to help easily monitor my available memory along with some quick links to my most used programs. What is new with their today plugin is that you can download directly from the phone, a selection of skins, and apply them at will. All of the initial skins available come in both VGA and QVGA formats. I tried to find any fault or suggestion to add to a suggested wish list for the next version, but I really cannot with a clear conscience do it. Resco has managed to improve what I have claimed as the number one software must have for WM users over the past several years, without losing any of the features that many of us have grown to depend on. I am now very interested in how they are going to top themselves next year. Resco Explorer 2008 offers something for everyone with out intimidating the newbie while still not forgetting the needs of the most advanced power users. This is a balance few have ever met with such precision as Resco has in their latest release of the award winning Resco Explorer. Advanced tools for power or IT users.